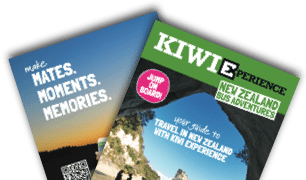 Kiwi Experience is New Zealands leading flexible guided bus experience designed by travellers for travellers. We are recruiting now to expand our on-road dream team. Are you outgoing, organised and passionate about Aotearoa? Do you love meeting people and showing them a great time? Do you want a travel job that goes to all corners of New Zealand? Are you keen to get paid to bungy jump, skydive or explore glaciers? Are you ready for an exciting and rewarding tourism job? If this job sounds like you - we're keen to for a yarn! Each year, Kiwi Experience offers mind blowing travel experiences to passengers from all over the world. Each trip is expertly driven, guided and commentated by one of our legendary Driver Guides. Our purpose built vehicles are equipped with the latest electronic assistance systems including ABS braking, ESC and Cruise control. You might have seen them around – our green buses operate all around NZ. Successful applicants offer excellent social, communication and organisational skills. You will be a confident speaker, able to think on your feet, be calm under pressure and possess an unwavering passion for delivering a truly unique and awesome Kiwi Experience to every passenger. Despite many saying they'd do this tourism job for free, our Driver Guides receive generous remuneration and incentive packages. If you're passionate about New Zealand and love the idea of sharing our slice of paradise with travellers - then opportunities don't get much better than this! NEW TO TOURISM? COME AND JOIN US! Working for Kiwi Experience is a job with a New Zealand travel and tourism icon. It's also a job within thl, New Zealand’s premier tourism company. Work hard, play hard is what we're all about. Our business has a relaxed dress code and fun environment, but at the same time has the latest technology and an innovative culture to ensure our brands continue to lead their respective markets. Everyone within thl loves New Zealand and loves showing it to the world. A job with Kiwi Experience and thl offers opportunity far beyond the drivers seat. It can take you to your future and beyond. Progression for good people means the world to us and it's something we can offer to the right people. For more information about the current crew of legendary Driver Guides check out the Kiwi Experience Driver Profiles. Still not convinced? Read our Top 9 best things about working for Kiwi Experience or check out this interview with National Road Manager & former Driver Guide Kane.